Alfa Romeo Giulietta TCT review | What Car? 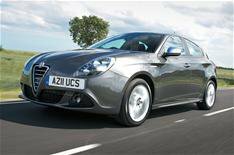 The Alfa Romeo Giulietta is the best car the manufacturer has produced in a long time, and its now available with a new TCT twin-clutch semi-automatic gearbox that gives it added appeal. Whats it like inside? We tried the car with Alfa Romeos 1.4-litre petrol engine, which features a unique type of valve control and rapid-response turbocharging to boost power and flexibility. Mated to the TCT gearbox, it pulls solidly and smoothly through the rev range, while the transmission seamlessly slots from one ratio to the next. The TCT transmission is essentially the gearbox that was introduced in the Mito supermini, albeit with different ratios and upgraded software. Theres also a new engine stop-start system to prevent the type of problems some Mito TCT owners experienced. In a nutshell, the Mito was so slow to restart that if you were sitting on a hill, you could easily find yourself rolling backwards when taking your foot off the brake to apply the accelerator. Although the new stop-start system still isnt especially quick, we experimented on several hills and the car showed no backward movement before pulling away. Otherwise, the semi-auto Giulietta drives much like its manual sibling. Its neither as comfortable as a VW Golf nor as athletic as a Ford Focus, but that Alfa Romeo petrol engine gives you a good deal more dash for your cash. Whats it like inside? Pretty funky, really. The dashboard is attractively designed, with a row of neatly arranged toggle switches, and big rotary dials for the heating and ventilation controls. Star billing goes to Alfas DNA rocker switch, which allows you to adjust the throttle responses, steering weighting and your desired level of stability control intervention. The exterior styling has an impact on practicality, most notably when it comes to rear access and headroom. However, the Giulietta is still spacious enough to carry four adults in reasonable comfort, and it has a good-sized boot. The TCT gearbox is available only with the more expensive Lusso and Veloce trims, so standard equipment includes dual-zone climate control, cruise control and Alfas Blue&Me hands-free system with voice recognition. Veloce models add aluminium pedals, leather upholstery and sports suspension. Should I buy one? The TCT gearbox is available with either the 168bhp 1.4-litre petrol engine or the 168bhp 2.0 diesel and costs 1350, plus an extra 260 if you want steering wheel-mounted paddles. Even so, the TCT is well worth considering because it works well and will lower your fuel bills; the 1.4 petrol TCT averages 54.3 compared with the manuals 48.7mpg, while the diesel manages 62.8mpg up from 60.1mpg with the manual 'box. Theres more good news if youre a company car driver considering the diesel car. Emissions fall from 124g/km to 119g/km, meaning its taxed at 13% instead of 18%, although it will jump back up to 17% in April, when stricter tax bands are introduced.